Mobile advertising in games is often little more than an annoyance for consumers who try to ignore banner ads that take up precious real estate. But startups are now looking to find ways to bring advertising into games that doesn’t interrupt the flow of the action, but still provides meaningful ways for advertisers to get their messages across. Last month, I wrote about Kiip, which uses the natural pauses in games when people achieve a milestone to offer them real-world rewards. Tap Me, another mobile advertising startup, now provides in-context ads with its first brand sponsor Redbox (s cstr). It’s a good example of how mobile ads are making the necessary evolution from something pushed on to users to something contextual they interact with and derive value from. What Tap Me does is allow brands to sponsor power-ups in games, so a user looking to go faster, obtain more health or have more endurance can get an in-game boost provided by a brand. By tying an advertiser to an object inside the game (preferably something related like an energy boost from Gatorade (s pep)), it makes the ad much more relevant. That also boosts engagement. Tap Me said earlier this year that initial tests found players chose sponsored power-ups as often as 20 percent of the time in games running Tap Me’s ads. In certain test games, it was more than half the time. If done well, developer, advertiser and user all come away feeling like winners. 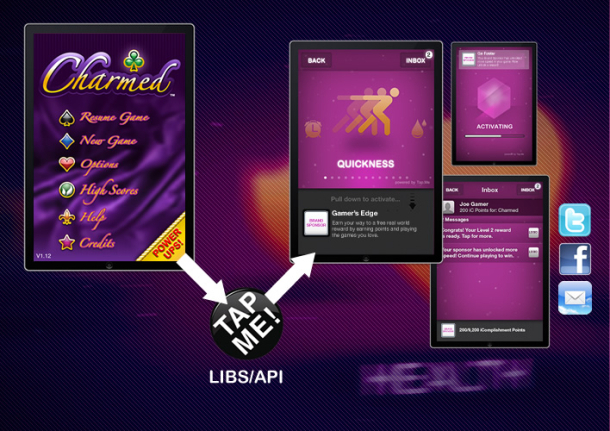 Tap Me also allows advertisers to send occasional messages within the game to a user. That allows for more follow-up and the ability to offer additional rewards to a user. Gamers, for their part, can share their rewards with friends and post them to Facebook or Twitter. It’s an interesting take on in-game advertising, and comes at a time when in-game incentivized offers are having to evolve. Now that Apple (s aapl) has begun closing the door on apps that use incentivized installs of other apps in exchange for virtual goods, developers who relied on revenue from running those campaigns need to look for other tools, including those from Kiip and Tap Me. I think these newer ad tools are a good reminder that context is king in mobile, and that extends to advertising as well. The more users can experience marketing within the flow of what they’re doing, the more effective it is. So far, Tap Me is being integrated into iOS games such as Kitten Cannon, Retro Revolution 2 and Charmed. It’s unclear exactly how Redbox, which is known for its DVD kiosks, will be integrated into certain games, but it will likely tie offers to its upcoming video game rental service. Tap Me still needs to sign on more developers and brands, but I think it’s got a good take on mobile game advertising, and it shows mobile ads have a lot of potential avenues for further innovation. Nice insightful article Ryan. I liked it overall but until you mentioned “Gamers, for their part, can share their rewards with friends and post them to Facebook or Twitter” I still wasn’t quite sure how users were going to be incentivized outside of the normal motivations associated with winning the game. I think there is a form of reciprocity that could develop from the sharing amongst friends and other users. Perhaps users will start to benefit from rewards other people post, not necessarily just their own rewards, and that will somehow give them enough incentive to share theirs – just have to watch out for free-riders. Building in some type of sharing/trading market for users that provides some type of exclusionary mechanism might eliminate the free-riders though (i.e., if they don’t have anything to share then they can’t benefit off of others sharing). This of course is under the assumption that the ads being tailored to users aren’t spot on because if they are then there will be plenty of incentive. But the association of ads to brands makes me think that they won’t necessarily be tailored to user’s interests – at least initially.